If you deal with computers at reception desks, in call centers, or in lab environments where users log in and never log off, computers can get really slow because of the applications left running by idle users. 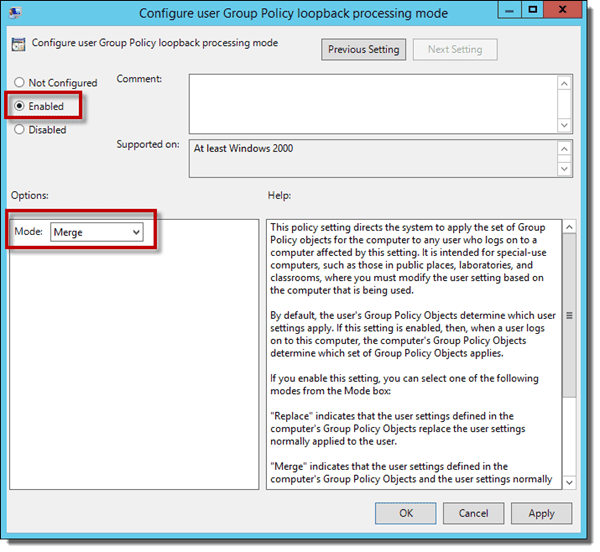 In this article, we'll show you how you can force those users to automatically log out with a few settings in Group Policy. Shared computer systems in areas such as reception desks, computer labs, and call centers can be brought to their knees very quickly if users lock the workstation and walk away when their shift ends. The next person sits down, clicks Switch User, logs in, and repeats the process all over. After enough users, there are enough random applications running in the background to slow the system to a crawl. So, how do you log off the idle sessions? Actually, it’s pretty easy with a free utility and a little Group Policy. Before we get started, I’d like to address two of the ways I’ve seen suggested as a way to handle logging off idle user sessions. One solution that used to be popular is the winexit.scr screensaver included in the Windows NT Server 4.0 Resource Kit. A systems administrator can set the workstation’s screensaver to winexit.scr, and the user would be logged off when the screensaver activated. This solution doesn’t take into account newer operating systems that include Fast User Switching. It also requires you to lengthen your screensaver activation time so you don’t accidentally log off a user who has gone on a break or lunch period. And, last but not least, getting this old utility to work correctly on newer OSs is just a pain. Do you really want to run something this old on your network if you don’t have to? 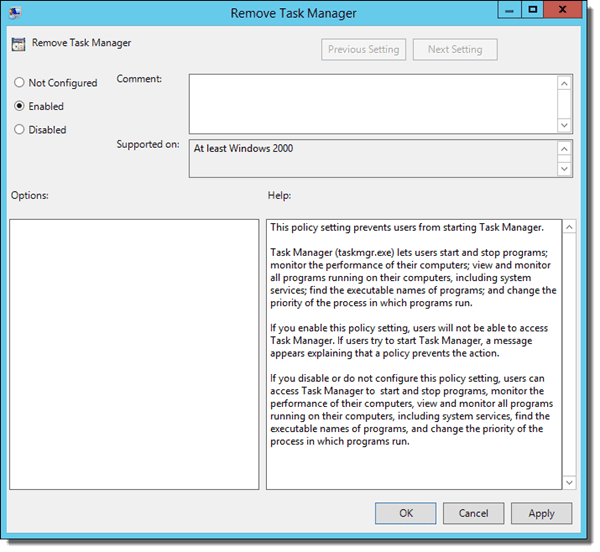 Another is a Group Policy setting that a lot of people point to as a solution to this problem. 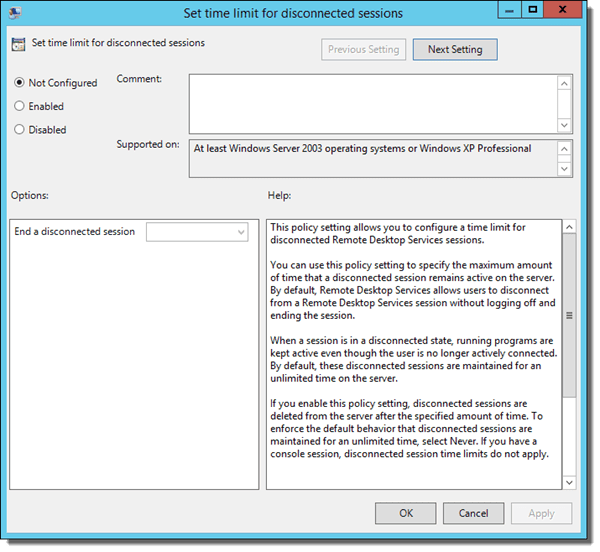 The setting is located in Computer Configuration > Policies > Administrative Templates > Windows Components > Remote Desktop Services > Remote Desktop Session Host > Session Time Limits > Set time limit for disconnected sessions. I’ve seen this setting recommended—a LOT—as a solution for logging off idle users. 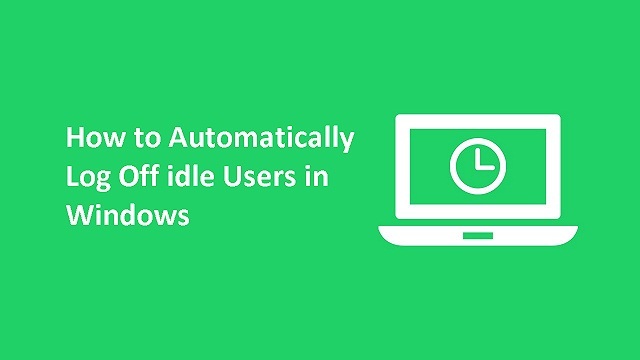 You can use it for logging off idle users on Remote Desktop Services (RDS, formerly Terminal Services). This session doesn’t work for physical computers that people are using at the console. 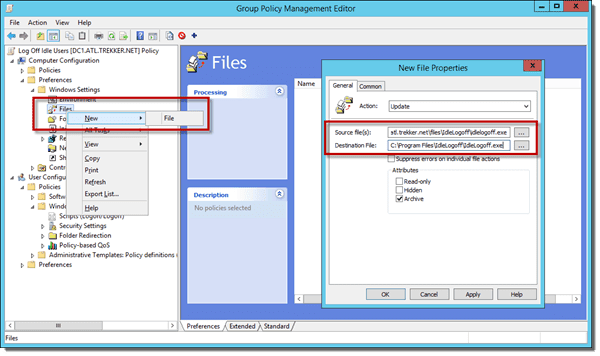 To set up our solution, we’ll need to create a new Group Policy Object (GPO) in the Group Policy Management Console (GPMC). For multiuser computers, I usually like to create a new sub-Organizational Unit (OU) inside the original OU that contains all the other non-multiuser computers. 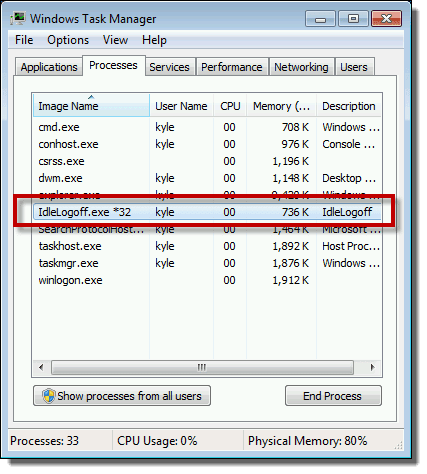 This lets the multiuser computers get the same Group Policy as all of the other computers without forcing the “idle logoff” on every single computer. Next, we’ll need to right-click the new GPO and choose Edit. 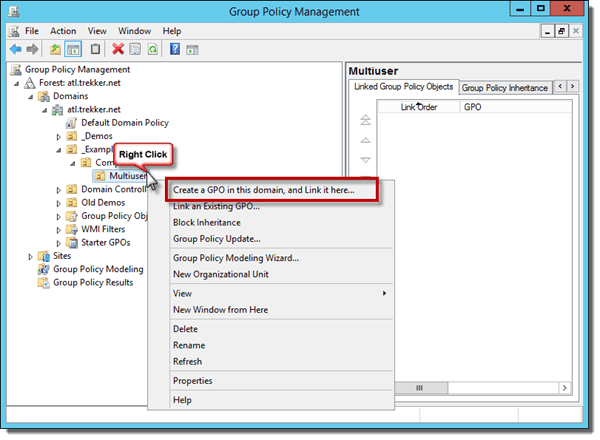 Once you’re in the Group Policy Management Editor, you’ll need to go to Computer Configuration > Policies > Administrative Templates > System > Group Policy > Configure user Group Policy loopback processing mode. Enable the policy and set it to Merge. This will let us apply a user-side policy to computer objects in Active Directory. Next, we’ll need to copy a small utility to the multiuser computers. Go and download idlelogoff.exe. For demo purposes in this article, I’m going to put my copy into Active Directory’s Sysvol folder. For a production environment, you’ll probably want to do this from a file share. Just make sure that domain computers have at least read-only access to both the share and the file system. Go back to your GPO and go to Computer Configuration > Preferences > Windows Settings > Files. Right-click Files and choose New > File. In the Source File(s) section, select the IdleLogoff.exe that we put into \\domain.local\sysvol\domain.local\files\IdleLogoff\IdleLogoff.exe. Set the Destination File value to C:\Program Files\IdleLogoff\IdleLogoff.exe. Next, we’ll need to set our user-side Group Policy settings. 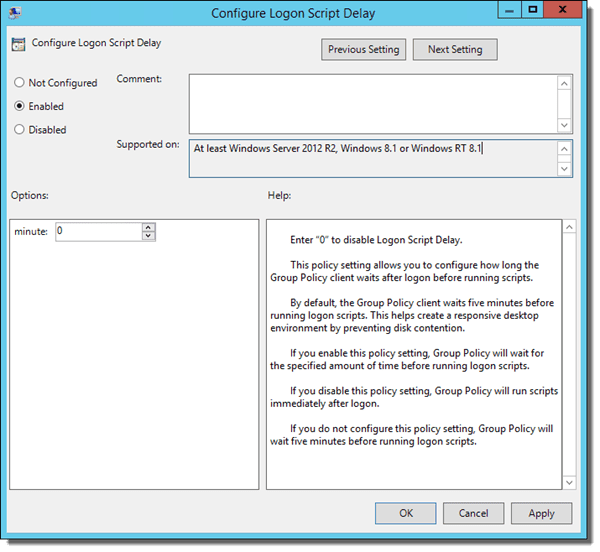 Go to User Configuration > Policies > Windows Settings > Scripts (Logon/Logoff). Double-click Logon on the right side of the window. Click the Show Files button to open a new window where you can place the Logon script we’ll use. The IdleLogoff.exe utility takes two arguments. The first argument is the time, in seconds, before taking action. In this case, I’m using 1800, which translates to 30 minutes. The second argument is the action to take. The valid actions are logoff, lock, restart, and shutdown. We want to log off idle sessions, so I’m using logoff. Last, we need to add the Logon script to the GPO. 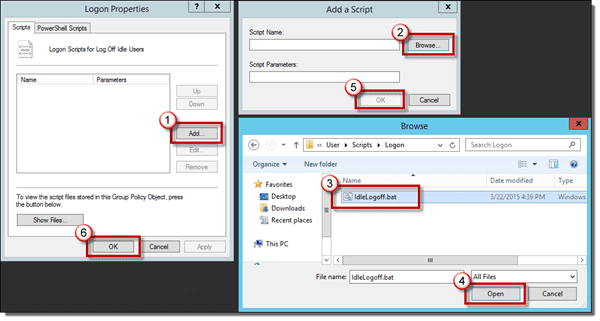 Click the Add button on the Logon Properties window, then click the Browse button on the Add a Script window, select the script (IdleLogoff.bat), and click Open. This will take you back to the Add a Script window where you can click OK. 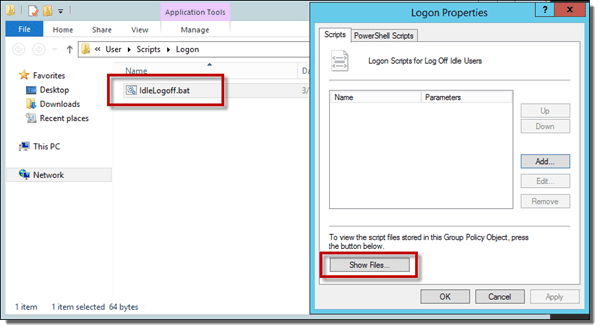 The Logon script will show up on the Logon Properties window; click OK.
On a test client, I’m going to run a manual Group Policy update by running gpupdate.exe at a command prompt just to ensure the system gets the settings in the GPO. Next, I’m going to go to C:\Program Files\IdleLogoff\ and make sure that IdleLogoff.exe is copied to the computer. 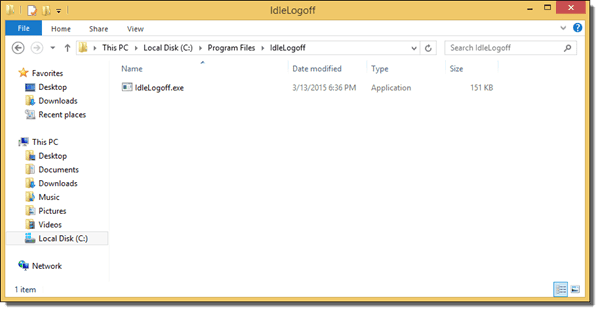 Next, we can run Task Manager and see that the IdleLogoff.exe executable is running in the background in the user’s session. A word of warning about Windows 8: Windows 8 includes a number of changes to make the system startup and user logon process faster. One of these changes is to delay the running of logon scripts for five minutes, by default, to make the logon process faster for the end user. Keep this in mind when deploying this solution to computers. 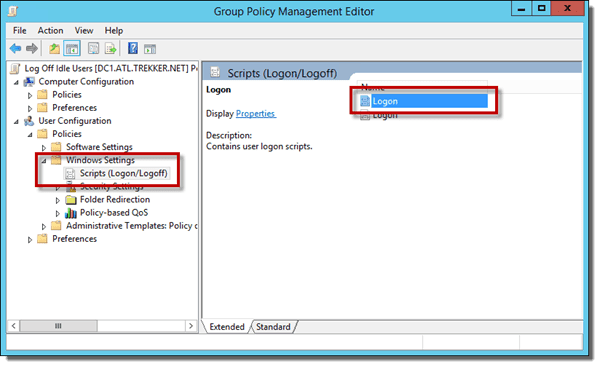 You can change this setting in Computer Configuration > Policies > Administrative Templates > System > Group Policy > Configure Logon Script Delay. The only problem with those solutions is that those are the same things malware can do to a system. And, you probably don’t want to implement a solution that looks a lot like malware, or you run the risk of your antivirus/antimalware kicking in and killing it. 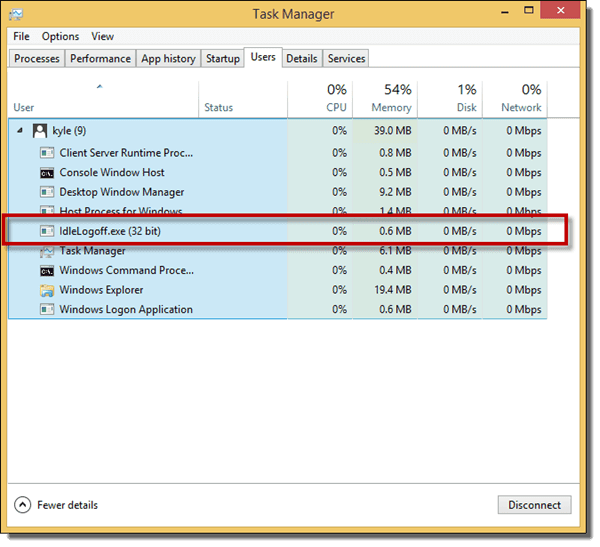 You can disable the Task Manager by going to User Configuration > Administrative Templates > System > Ctrl+Alt+Del Options > Remote Task Manager. Set the policy to Enabled and click OK.
Lastly, communicate this new policy to people who may be impacted by the change. Some reception desk computers may need the idle logoff time set anywhere from 45 to 90 minutes so the primary user isn’t kicked out of his/her session while on a lunch break. Other locations, such as computer labs, may need it set to something lower—maybe 15 to 20 minutes.